Fin-de siècle Paris was caught in the throes of change on every front, and dance was especially well-suited to represent the forces of both new and old. 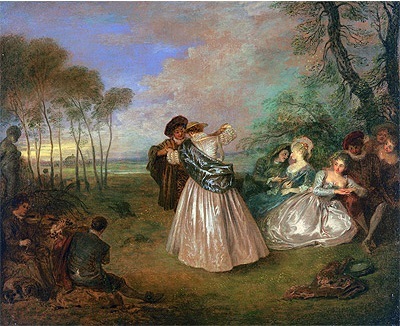 Watteau's eighteenth century painting nicely conveys the restraint and propriety of old-fashioned dance; new-fangled dances like the cakewalk were an affront to this tradition of order and formality. Debussy found himself smack in the middle of that debate, and he wrote both minuets and cakewalks! The curvacious arabesque, so beloved by Debussy, is put to both artistic and utilitarian architectural use in this Paris metro stop at Abbesses, designed by Hector Guimard. It's one of only two of his metro designs still remaining. Debussy's piano pieces entitled "Arabesques" mimic those curves in the shapes of their melodies, and many of his other pieces have similar contours which turn in on themselves. The curvaceous lines of art nouveau were found in far-flung places, most of them pertaining to the feminine: jewelry and ceramics were favorite mediums, and paintings often fixated on the shape of women's long hair. Maud Allan was famous already as Salomé when she undertook her ill-fated collaboration with Debussy on Khamma in 1911. Looking at this photo one can well-imagine how she might have affronted Debussy; he was far from a prude, but was given to far more delicate expressions of sensuality. Here's the poem that inspired Debussy's 4th Prelude from Book 1, "Le sons et les perfumes tournament dans l'air du soir." Already in the first verse it refers to a melancholy waltz; dance was never far from Debussy's sensibility, and a waltz bridged nicely across centuries. Moreover, the poem brings to mind Loie Fuller, that seductive dancer with veils who inspired Voiles, the second prelude of Book I. She,like Baudelaire, was fascinated by synesthesia and used lights and colors in revolutionary ways to augment her dance spectacles. Debussy, like Fuller, Baudelaire, E.T.A. Hoffmann, Scriabin and countless other luminaries, loved the idea of the senses blending and refusing to acknowledge boundaries. Here's Loie Fuller in her full swirling panoply of colors. Posters of her abound; the combination of color and motion was irresistible to artists of the time, and the Louvre still features sculptures of her as well. One would expect ballet to be a bastion of conservatism, but Diaghilev's Ballets Russes took Paris by storm in the early 20th century with its uninhibited take on sexuality. Nijinsky's portrayal of Debussy's Afternoon of a Faun was shocking to both the public and the composer, and the dancer and composer were set on a collision course which culminated in the disastrous production of Jeux. The early dance pieces are all testimony to Debussy's life-long affinity for dance as well as an interesting reminder of how much more adventurous his interests became later on. At all times, though, the suppleness of his rhythm inevitably invited movement and as the titles below illustrate, his interests ran the gamut across traditional genres. Petite Suite is one of Debussy's most popular pieces with students: it's full of charm, and it presents no serious technical obstacles. The titles of its movements refer to a boat ride, a parade, a minuet, and a ballet-- they testify again to the more conservative tendencies in his earlier compositions and the pastimes they evoke. Suite Bergamasque has achieved fame because it includes "Clair de Lune," but its other movements are equally important. Their reserve and refinement remind us of Debussy's allegiance to the the baroque dances which had engaged his countrymen, Couperin and Rameau, some 200 years earlier. This little-known ballet was a failure as a dance, but has benefitted from the recent trend to perform Debussy's orchestral scores on the piano. Debussy's take on Mallarmé's poem has been wildly successful in its orchestral version, but it is only rarely performed by a solo pianist. Again, the piano version, with its evocative pedaling and enormous dynamic and registrar range, deserves attention. This is one of the most delightfully ambiguous of the preludes, sporting a title that can mean either "sails" or "veils." Both float and billow in the wind, but the image of Loie Fuller, the American dancer who entranced Paris with her dances of veils, makes the choice of "veils" a more intriguing title. It's no coincidence that she choreographed several of Debussy's works; the two artists shared an aesthetic that prioritized mystery and coloration.